Ok people, it’s time to get back in the shop. Summer is over, Labor Day is gone so you can’t wear the white apron any more this year. Holiday season is coming, and it’s time to make something. Summer time is when we all head off in different directions, vacations at the beach, trips to the cool mountains, pool time with the kids at home. 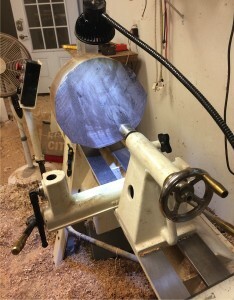 While you were gone, the shop dust settled, and those projects you were so hot to work on last spring may not look so good after you have not seen them for a few months. Now if you are like me, you really don’t want to do anything but the woodworking you love. I heard Mr. Norm say once on his show that everyday when he goes to the shop, he takes the first five minutes to pick up or clean up something. I think that is an excellent idea. I thought the floor was pretty clean. So what do you do first? I think we would all do well with a good sweeping. I swept my shop a while back and thought it looked pretty good. Right after sweeping I took some pictures for some turning projects and someone who saw them wanted to know when I was going to sweep the floor. Hurt my feelings, but perhaps is an indication of how hard it is to get the shop really clean. I think a good sweep, then a good vacuum down on your hands and knees to get all that fine dust, and finally a good brush with the trusty shop brush will do the trick. We will continue next time with the rest of the steps to get your shop in shape for the New Woodworking Season. It’s going to be all right!! I thjnk a few chips on the floor shows that I do more work than cleaning the shop. I do make an attempt after each work project to get most of the chips before I go to the next one. I have to clear up after each job because my ‘shop’ serves all my handiwork needs from model making to turning to cycle maintenance – all of which are ongoing throughout the year, so I never have that ‘return to the shop’ event.